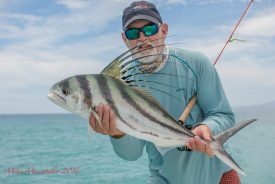 The Roosterfish (Nematistius pectoralis) named “Ricky Ranchero” (Tag ID: GFR15579) was originally tagged & released by angler John Isby on April 22nd, 2016 while fly fishing with captain Israel Locero and mate Gary Bulla aboard the charter boat Luciano V, out of Bahia Muertos, Baja, Mexico. The Roosterfish was estimated to be 24 inches (60.96 cm) total length and had an approximate weight of 15 pounds. 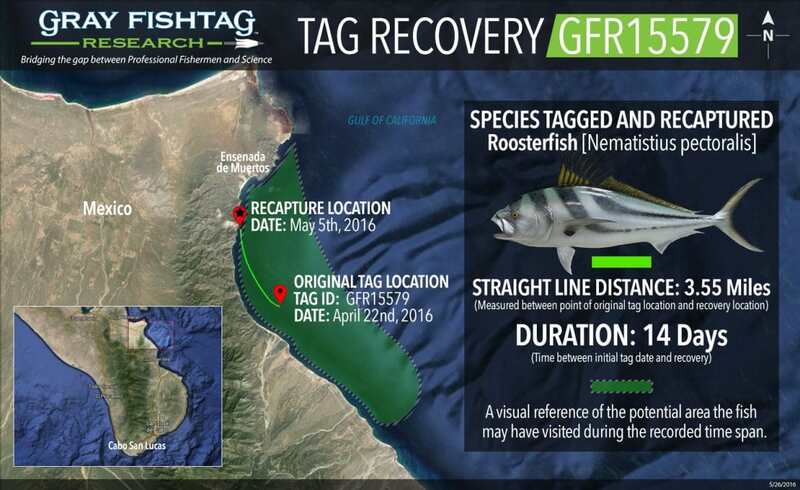 The Roosterfish was recaptured 14 days later on May 5th, 2016 by angler Capt. Brian Horsley while fly fishing with Captain Valente Lucero and mate Gary Bulla aboard the panga boat Venadito out of Bahia Muertos, Baja, Mexico. The recapture was in the coastal waters of the Sea of Cortez near San Juan de Los Planes, Mexico. The recapture location was approximately 3.55 miles (5.72 km) away from the original tag location. During that 14-day time period, the Roosterfish most likely stayed in the local coastal waters where the food source was plentiful. That area is ideal habitat with its near shore abundance of small fish, such as ladyfish, halfbeaks and herring, which is a food source for the Roosterfish. At the time of recapture, the Roosterfish had an estimated length of 30 inches and weight of 18 pounds. After the tag information was recorded, the Roosterfish was subsequently released healthy and unharmed. Roosterfish are bluish gray in color with four dark bands, the first located around the eyes, the second on the rear of the head, and last two bands curve and run along their sides. Their first dorsal fin is very elongated with seven spines (i.e. Rooster). The Roosterfish is a schooling fish that inhabits mostly nearshore coastal waters with sandy or rocky bottoms. Not much is known about the biology of the fish. Roosterfish are a highly prized recreational sport-fish species. They are characterized by their strong and intense fight. The Luciano V charter boat crew will receive some Gray FishTag gear for their tagging efforts. Angler Brian Horsley will receive a pair of Costa Del Mar sunglasses, a Tag & Recovery Certificate, and Gray FishTag gear for reporting the tag recovery.